At D and S Campground your Missouri River camping experience is relaxing and perfect. 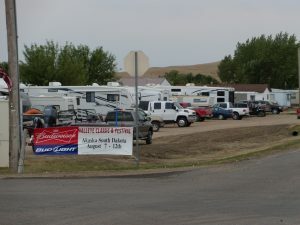 D & S Campground has 30 campsites with water, city sewer, and electricity (20/30/50) and 11 with just electricity (20/30). Campsites are rented by the day, week, month, or seasonally. The longer you stay the better the rate. There are bathrooms with showers for campers. The campground has security lights, mature trees, fire pits, and picnic tables. The south campsites are popular with families with children. You can watch your kids playing at the Akaska playground from the campsites. We also have eleven parking spots for boats, campers or vehicles with electricity. D & S Campground offers many outdoor recreational features to make your camping, fishing and hunting experience relaxing and memorable. It is close to the children’s playground, church, Community Center, a supper club, restaurant and bait/tackle shop. We are nine miles from Lake Oahe. There is a blacktop road to the Swan Creek Recreation Area with two boat docks, parking areas and a nice fish cleaning station. You do need a SD park sticker on your vehicle to enter the recreation area. In addition to our proximity to the Missouri River for camping, we also have a great lodge available with lots of room for friends and relative that want to stay, but may not have a camper. Check out our D & S Missouri River lodge for more information. Contact us today to book your Missouri River Campground stay. Many of our weekends get completely booked so call early to guarantee you have room.